Did you know there are multiple ways that you can support our work? Below are a few of the very generous programs that business sponsors in our community offer to help BirchBark Foundation. You can help save a life just by going for a walk, shopping, through pet supply companies that offer assistance and even through a program sponsored by your employer. If you'd like to learn more about how you can help or know of a program that could benefit BirchBark Foundation that isn't listed below, please email info@birchbarkfoundation.org. 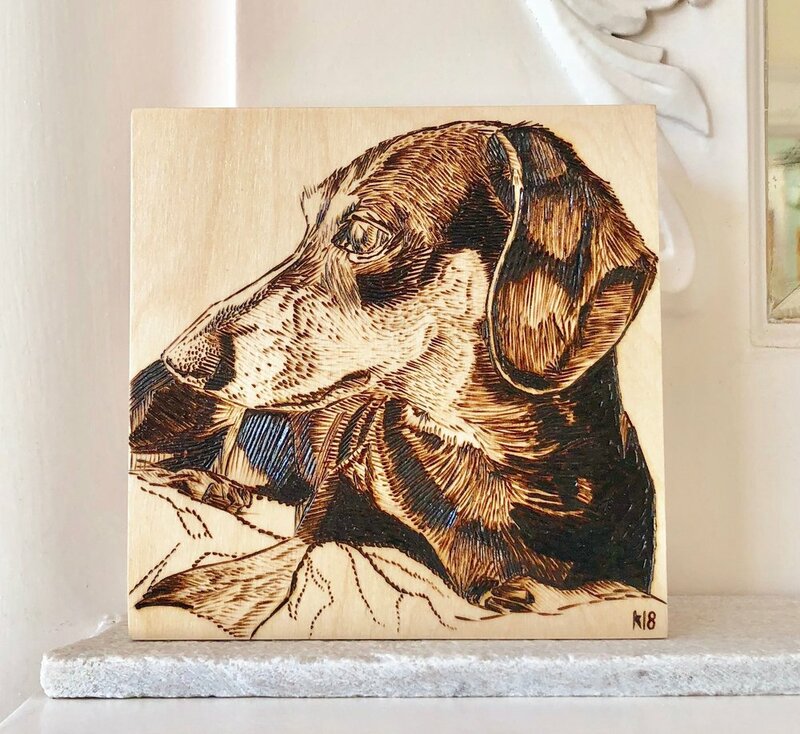 Burnin’ Love Pet Portraits will donate 10% of all sales to birchbark! Kim Kasner’s entry into the world of pet portraiture was at a local dog-themed PTA fundraiser in a dog park near her apartment in San Francisco. It was a fun, sunny day, filled with furry friends, and the reaction to her booth's display from passers-by was extremely positive. Her first order that day was for a couple who cried when she delivered their cat portrait to their doorstep (it was a memorial). Kim was hooked. Since starting in 2015, Kiim has experimented with multiple burn pens, a blow torch, ammonium chloride and an electrician's heat gun. She has worked with Baltic Birch, Basswood, Monterey Pine and Acacia and pays close attention to the quality of the materials, using panels originating from sustainable mills, and sanding everything as smooth as the grain will allow. “When I hear little details about the pet, do the work, then get a follow-up description of the reaction from the recipient of the piece (often healing tears or much-needed smiles), I'm reminded of why I keep doing this, and I get to feel that fullness that I felt from that first order all over again. 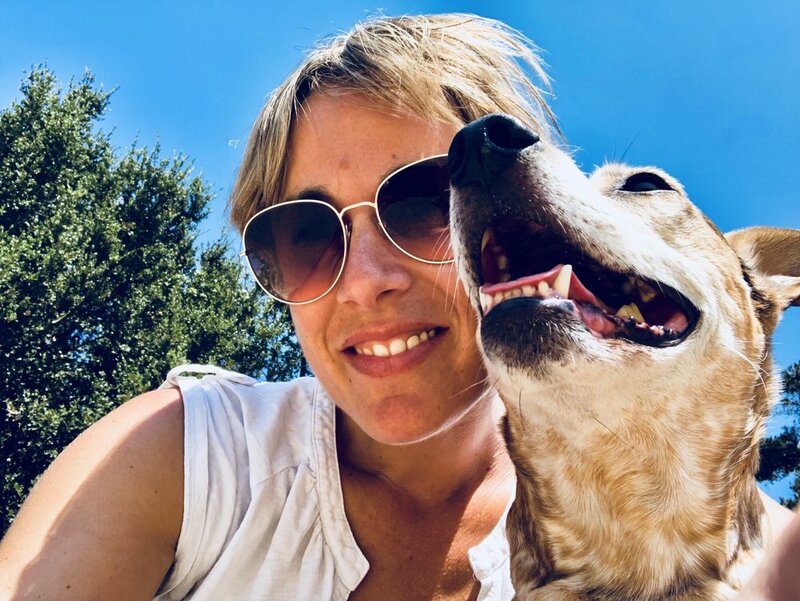 I'm very interested in our human connection to our pets, our very real need for them, as well as the bond our pets help foster between us as humans. 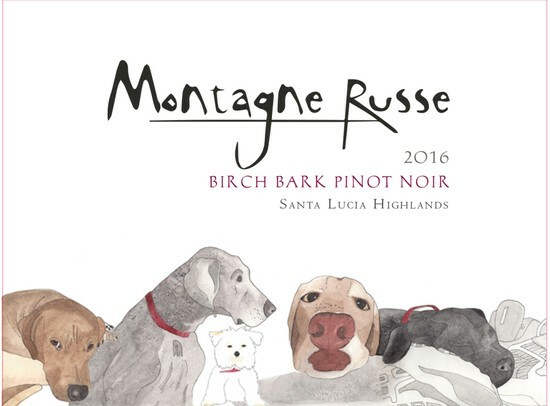 The 2016 BirchBark Pinot Noir label features images of all the dogs who were part of the Montagne Russe Vineyard Family over the years. Montagne Russe will donate $10 per bottle to BirchBark Foundation for every bottle of 2016 BirchBark Pinot Noir sold. In 2016 Montagne Russe took full advantage of the ripe conditions to create a juicy, full bodied pinot from Tondre vineyard. This wine has a rich under underbelly of ripe strawberry and rhubarb. The winemakers paired the body of the 667 clone pinot with tight grained French oak, 15% of which was new. This wine recently won double GOLD at the San Francisco Chronicle Wine Competition. What kind of pet is special enough to put up on a store wall? Yours! Donate $250 to BirchBark Foundation and Pet Food Express will celebrate your gift with a My Mutt poster of your pet displayed in one of their stores. A professional pet photographers will call to arrange a photo shoot of your adorable pet. You choose the image, and we print a large, high-quality poster on UV-protected Sintra board. Once it’s on display in the store of your choosing, you get to see your pet every time you shop for food and supplies. Shop at Smile.Amazon.com and a percentage of EVERYTHING you buy at Amazon will be donated to BirchBark Foundation. AmazonSmile is a simple and automatic way for you to support BirchBark Foundation every time you shop, at no cost to you. When you shop at smile.amazon.com, you’ll find the exact same low prices, vast selection and convenient shopping experience as Amazon.com, with the added bonus that Amazon will donate a portion of the purchase price to BirchBark Foundation. Choose BirchBark Foundation today as your Amazon charity! Chewy.com $20 Donation for new first time orders! The BirchBark Foundation has teamed up with Chewy.com. For every NEW customer who makes a purchase with Chewy through this link, they’ll donate $20 to the BirchBark Foundation. Give Chewy.com a chance today and help BirchBark Foundation raise funds to help save more pets whose family is struggling to pay for their much needed care during a medical emergency. Don’t just take your dog for a walk… Take your Walk for a Dog! 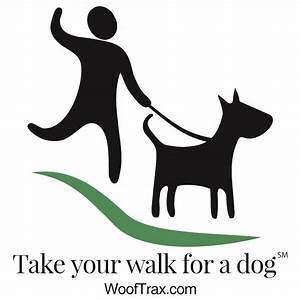 Go to WoofTrax.com, download the app, and support BirchBark Foundation every time you walk your dog. 1. Download the free app at www.wooftrax.com. 2. Choose to walk for The BirchBark Foundation. 3. Add a dog as your walking companion. 4. Tap “Start Walking” and take a walk! 5. Get your friends to sign up too!